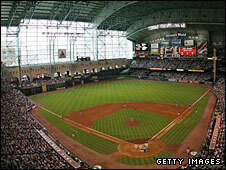 Houston Astros' late dash for Major League Baseball's play-offs has been halted by the advance of Hurricane Ike. Having won 14 of their last 15 games, the Astros called off Friday and Saturday's games against Chicago Cubs. Monday's Houston v Baltimore NFL game has also been postponed after the storm damaged the Texans' Reliant Stadium. It will now be played on 9 November. Torrential rain across the United States also caused five other baseball games on Friday to be postponed. Many of those games will be rescheduled as double-headers on Saturday - with 20 games in all due to be played, and all 30 MLB teams in action apart from the Astros and Cubs. Houston's Minute Maid Park stadium has a retractable roof, and should it survive the storm without major damage, they could reschedule the three-game series against the Cubs with a double-header on Sunday and a game on Monday, when both teams have a day off. Alternatively, they could be moved to a neutral venue - with Milwaukee's Miller Park reported to be among the contenders - or played after the end of the regular season. Houston's late-season run, with ace pitcher Roy Oswalt currently on a streak of 32 consecutive scoreless innings, has seen them climb to within three games of the Milwaukee Brewers in the National League wildcard race. The Los Angeles Angels at Anaheim are the only team to book their place in the post-season so far, after clinching the American League West division.